I said I would split up the cleaning products and that I have. Today we’re talking bathrooms, people. I cannot tell you how much I hate cleaning pee off the floor. I hate, hate, hate cleaning the bathroom more than anything. The shower is so annoying and who put tile everywhere!? Whose idea was that? Obviously a man who didn’t have to clean the bathroom! The starter kit is a great idea. Why? Beacuse you need all three of those products. The daily shower cleaner is a big life saver if you have tile showers like we do. That tiled shower is the bane of my existence and this has definitely lessened the blow. The toilet cleaner is one of the best and this spray literally does it all. I love it. The glass and surface cleaner isn’t just for the bathroom, but you can’t clean the mirrors with the toilet cleaner so get this. And the wipes? OMG. I love these wipes. They’re flushable and so awesome for wiping up that bit of conditioner you didn’t feel like rinsing off the shower wall or the messy knobs on the sink. They are the greatest. I make no bones about it, I love method. I really do. 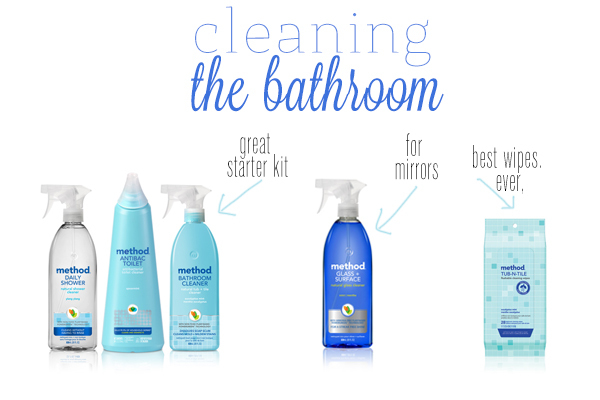 Their products smell amazing for cleaning products and are at a great price point. On my kitchen post a lot of people commented about loving Meyers and while I think Meyers smells amazing, I think the prices are akin to highway robbery. So I choose method because I am not a millionaire and I really want my Rag + Bone booties, okay? If you missed part 1, go back and see my cleaning picks for the kitchen! LOVE method. So one of my customers, Quidsi (owned by Amazon) just launched this all green products site http://www.vine.com – D is going bonkers over it. it has EVERYTHING. Pee on the floor. The worst. I love method. It’s the best and I’ve tried it all! Daily shower cleaners are so necessary. I’m ignoring the pee on the floor comment. the wipes seem like a wonderful solution for lazy cleaners such as myself. love that they are flushable. hope shipping isn’t too much. I’m reading this after I just cleaned the toilets! I think I just fell in love with you and those wipes. I need those STAT!